How to make a long, very thin tapered cut? 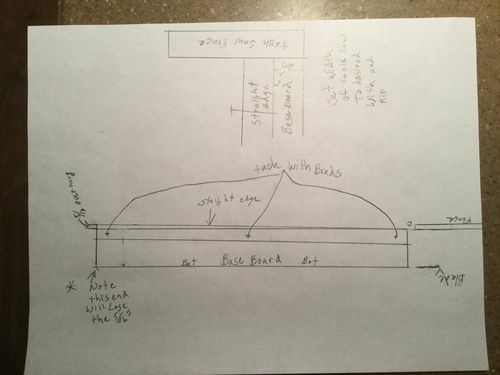 I have a 12 foot piece of molding I need to cut to fit. 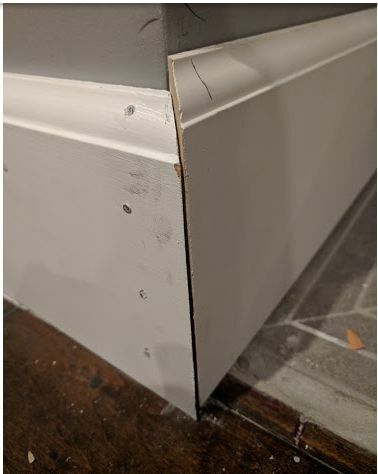 The floor is uneven, so when I place the molding, one end fits the adjoining piece of molding perfectly, but the other side is 5/16” too high due to the floor. So I need to taper cut the bottom edge of the molding, from 5/16” on one end to 0” on the other end. I do have a good tablesaw, but not much experience. Can anyone give me advice on how to make such a slender tapered cut over a 12’ length? Thanks nubsntubs, but I’m not sure what you mean by “make it fit then nail it down”. It’s not gonna fit unless I cut it. I added a photo above that might help better explain what I’m seeing. This is the end that’s off because of the poorly laid tile floor. The other end fits flush as it should. Just to be clear, it is not just the one tile at the end that is off, the entire floor gradually rises from 0” to 5/16” over a 12 foot span. planes are useful too for this sort of thing. bandsaw? might need some help holding a 12’ long piece, but it’ll let you trim that little bit free-hand. I see the photo now. all the above suggestions will work…... just depends on your skill and tools available. I have run into this situation several times before renovating older homes. 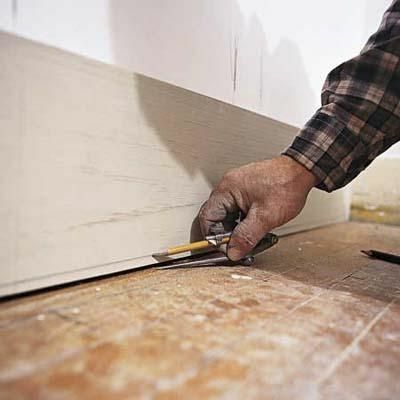 nothing to be afraid of – it is only baseboard…... if you mess it up, get another board. I just purchased a 1957 home and ALL the baseboards are messed up and will be replaced. and with sagging uneven floors, I will be addressing the same issues that you have. Thank you guys, that’s a great idea! Maybe I can clamp another board to the top of that molding as a guide, and then use the circular saw as you said. Seems a lot easier than trying to cut with the tablesaw. Or the chalk line and just freehand it as suggested. Doesn’t have to be perfect. A picture is always worth a thousand words, but I’m gonna make it less than that. If you have a jointer, taper cut the board. in this case, start your board about 3-4 feet on the out feed table. If you don’t have a jointer, scribe a line on the board, and free cut it on your table saw, starting somewhere about midway. My above comment was thinking the floor rose some causing the board to lift. Hand planes are useful too for this sort of thing. I make long tapered pieces with my hand planes all of the time….by accident! : ) I bet if I was intentionally trying to make it tapered it would come out straight. With 40 years in finish carpentry behind me, I’ve installed miles of baseboard. SOP is to scribe the baseboard to the floor. A straight cut is almost never a good fit to the floor. Shim up the low end (if there is one)—temporarily—and set a scribing tool (I use a cheap compass) to the amount of desired “drop” and mark along the bottom edge. Cut with jigsaw, circular saw, grinder, belt sander, block plane, or whatever you like. For large amounts, I use a jig saw. Once I’m close to the line I switch to an angle grinder with a sanding disc. A back-bevel is also helpful. i use to scribe the molding as described by Jerryminer and use an electric hand plane to approach the scribe line. If i needed to fine tune it further, I’d hit with a hand plane. Secure the molding at your bench or saw horses. I found it easier and safer to use the tool against such a long work peice, rather then trying to send the work peice through a sationary tool. Another suggestion is to back bevel the cut slightly. That makes it easier to “tap” down the moulding to fit the floor, if needed. Scribing is the way to go. For me, I would jig saw close to the line and then fine tune with my portable belt sander with a 40 grit belt. Makes short work of something like this.